Best Guide in Wine Country ! Just call or email us we will tell you what our guide has going on the day you want to go. Our guide guarantees a minimum of 4 wineries, a Full Tour of one of the wineries. Often our clients end up going to 4,5 or even 6 wineries, depending on the day and how busy it is. Often the tour stops for lunch at a winery with a restaurant, you pay for what you consume at lunch, the guide waits then continues on. Gray Monk Estate Winery is the King or Queen estate of the northern area, A fairly large winery with large tanks & a substantial educational winery tour. Lots of information on the history of wines & the area. Gray Monk, established in 1972 boasts over 50 acres of vineyards, a restaurant & large sunny deck boasting a “Stunning View” of Lake Okanagan !Featuring award winning VQA wines & culinary delights from the chef. Large selection of specialty white wines. Gray Monk Winery also hosts a fantastic dinner / entertainment event at the winery in fall around harvest time. Arrowleaf Cellars It’s a small & quaint winery with a great view of the lake & vineyards in the foreground. It offers picnic tables with shady trees nearby for those hot days. We held a media wine tasting event in our lodge last fall. Arrowleaf Cellars Merlot was the Event Winning Red Wine, judged by a panel of various media people. Scroll down for more info on Arrow Leaf & photos. Calona Vineyards has the distinction of being British Columbia’s original winery. As a pioneer in the BC wine industry, Calona Vineyards often leads the way to higher levels of craftsmanship Calona’s wines are award-winning, rivaling the world’s most established names while complimenting the Okanagan Valley & its growing international reputation. Visit the multitudes of unique wineries overlooking spectacular Okanagan Lake with a breathtaking panorama view that will make you feel like you never want to leave. Includes an in depth tour of one of the wineries & tastings at all wineries visited. Tasting fees & entrance fees included in our price. Enjoy sampling of the featured & wines sold only at the winery. Gift shopping is very popular. Mission Hill Family Estate huge winery, tours of this winery are a bit pricey. Fine art, stunning architecture, major tours & special tastings available. In summer they have a 5 star outdoor dining experience. Enjoy the special setting overlooking the vineyards and lake. Quails’ Gate Estate Winery has the famous Old Vines Patio, serving gourmet treats, with a great view of the lake. Good things happening at Quails’ Gate. A wide variety & some unique one of a kind gems. Make sure you check out the Old Vines Foch, one of the best red wines in all of Okanagan Wine Country. Mount Boucherie Estate Winery The Gidda family has grown wine grapes in the Okanagan since 1968. Mt. Boucherie has lots of variety at this stop. Very friendly staff. Gift Shop. Rollingdale Winery Small winery offering whites & reds, very famous for ICE wine. Visit 3 distinctive & unique wineries on the Eastside Bench overlooking spectacular Okanagan Lake & the city of Kelowna. Includes an in depth tour of one of the wineries & tastings at all 3. Tasting fees & entrance fees included in our price. Enjoy sampling of the featured wines at all. Gift shopping at the wineries. As you travel into the region you will find yourself feeling like you have left the city and entered hidden wine country, vineyards will appear & in minutes you will be in the heart of the area. Most have areas for enjoying a glass of wine outside under the shade or relaxing and just taking in the stunning views. Summerhill Estate Pyramid Winery this is Canada’s most visited winery & has Canada’s Largest Organic Vineyard. The pyramid is a must see and visit while visiting this appellation. Famous for Bubbly ! CedarCreek Estate Winery Situated on a hillside overlooking Okanagan Lake surrounded by 40 acres of vineyards. Stunning majestic views will take your breath away. Cedar Creek Estate Winery is one of the most established and best recognized estate wineries in the Okanagan Valley. St. Hubertus Estate Winery The St Hubertus and Oak Bay Vineyards were originally planted in 1928 by J.W. Hughes during a time when good agricultural land was plentiful. Today, only a few of the original vines exist but the same choice growing conditions continue to produce the high quality grapes for which the vineyards are known. Using organic techniques, the Gebert Family have carefully nurtured the vineyards into top condition. Self Guided Notes: On the way out stop by Calona Vineyards & Sandhill right downtown. 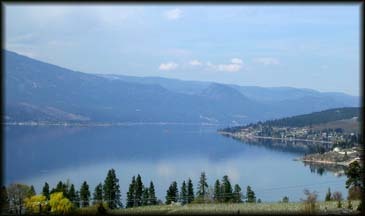 Then enjoy the drive up Pandosy & Lakeshore with views of the lake, beaches, parks & shopping. Ample signage is posted directing you to the wineries, make sure you get a map when you get to the first winery. We have 6 “Award Winning Wineries” very close to our lodge. Ancient Hill Winery is just 10 minutes drive, a small gem. Grey Monk Winery & Arrow Leaf Cellars. Wineries offer wine Tastings, on site sales, gift shops & winery tours. Give us a call to organize your Kelowna wine tour. Lots more to see and enjoy ! Many others are not too far away. 25-35 min drive to the Mission Area where one has a choice of many including some quite famous ones. Click here for Mission Area & Over the Bridge tours & wineries. This is one of the most fun things to do for adults in the valley. You will find the staff at the wineries both informative and eager to serve you. Don’t be afraid to ask questions about the vineyards & special efforts that go into the wines. Most wineries have very small lots of specialty wines that are only sold at the winery. Always ask about these as they are in very limited supply. A great gift idea or memento to take away with you after your vacation. Our closest & most popular wineries to our clients at the Borgata Lodge are 15 – 20 min drive. You will pass by all kinds of orchards, that show the variety of fruit grown in the Okanagan Valley. Once you get to the top of the hillside you will start to overlook Lake Okanagan to the west & the northern part of the Okanagan valley to the east. Follow the signs & in just a few minutes you will be tasting world class Okanagan Wines. Arrowleaf Cellars is the first winery you will come across. It’s a small & quaint winery with a great view of the lake & vineyards in the foreground. It offers picnic tables with shady trees nearby for those hot days. Call in advance and they can arrange for a very personal tour of the facility 250 766-2992. We held a media wine tasting event in our lodge last fall. Arrow Leaf Cellars Merlot was the Event Winning Red Wine, judged by a panel of various media people. Scroll down for more info on Arrow Leaf & photos. Gray Monk Estate Winery is the second winery you will come to, its just down the road a bit more from Arrowleaf Cellars. Gray Monk, established in 1972 boasts over 50 acres of vineyards, a restaurant & large sunny deck with a stunning view of Lake Okanagan. Featuring award winning VQA wines & culinary delights from the chef. A fairly large winery with large tanks & a substantial educational winery tour along with lots of information on the history of wines & the area. Large selection of specialty white wines. Gray Monk Winery also hosts a fantastic dinner / entertainment event at the winery in fall around harvest time. From Kelowna drive north on Hwy 97 to Winfield, turn left on Berry Road, then right on Okanagan Centre Road and left on Camp Road (by the fire hall). Follow Camp road to 1574. Keep an eye on your left for the entrance. There are many ways to enjoy a wonderful wine experience at Gray Monk along with your tour. The Grapevine Patio Grill, where you can enjoy gourmet food & wines by the glass on the lovely deck overlooking the beautiful Lake Okanagan. Famous for white wines. Kelowna Wine Tours a great way to spend a day !